Has your kitchen décor grown stale? Giving your kitchen a healthy makeover could be in over. Here are a few interior tips to get the room looking and feeling fresh again. 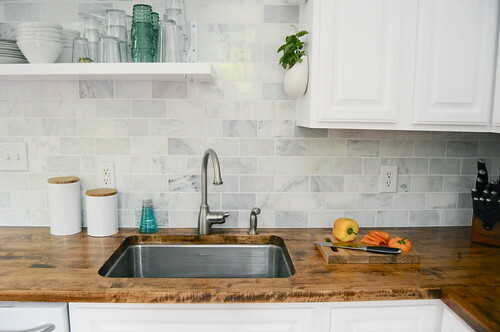 A new countertop can immediately transform the look of your kitchen. Marble and granite are two luxury choices for those that have the cash behind them. For a more budget option, butcher’s block or laminated wood are more appropriate. In some cases, you might not even need to change your countertop. There are crafty paints out there that can make it look like a fresh material (there are even faux-concrete paints). Adding some new light to your kitchen can help to bring it to life. Consider swapping out a single overhead light for track lighting to give added brightness. Decide whether you want warm or cool lighting. Warm lighting can go well with woods and brightly coloured materials giving off an earthy mood. Cool lighting works well with steel surfaces and stone countertops giving off a more clean and synthetic feel. Decide which lighting best suits the ambience of your home. Now could be the time to freshen up your kitchen plumbing. Water pump repairs may be in order. Alternatively, if you live in an old house and have noticed reduced water pressure, pipes may be starting to fur up with rust or limescale and be in need of a replacement. Plumbing can be costly so be careful what work you get done – moving piping to appliances such as washing machines and sinks may not be worth the expense. Kitchen cabinets may have become faded or paint could be peeling from them. You needn’t buy new ones if they’re still functioning well – instead why not add a new fresh coat of paint? You could try a glossy colour to make them a little more modern or even a chrome colour for a metallic feel. Also consider whether you want to replace handles and drawer pulls. This is easy to do and can dramatically change the look of your cabinets. Rip up that old linoleum in exchange for something more tasteful and chic. Laminated wood can be the perfect kitchen material for providing a natural and earthy touch. Polished ceramic tiles meanwhile can be great for matching stone countertops or steel chrome. You may be able to find an easy drop fit solution that saves having to dig up and replace floorboards. If you have a large kitchen floor that is largely empty, consider adding a rug to fill the space. Make sure that the rug is easy to clean as being in the kitchen it could get bits of food and drink spilled on it. Carpets in a kitchen are a big no-no – if your property has these, make removing them your main priority.